When should political leadership be shown? My view is that when in Opposition, especially with 5 year terms, there is ample scope to re-educate the public on matters relating to policy and economics. The concept of being in political Opposition is to ‘oppose’ rather than just play it safe and wait for the government of the day to collapse from incompetence or unpopularity. If the British Labour Party politicians really understood the implications of the body of work we have created which is now called Modern Monetary Theory (MMT) then they would not be advised to put out crazy documents like the Fiscal Credibility Rule. That Rule will crucify Labour. The advisors think they are being crafty by couching the Rule in orthodox neoliberal language so that the ‘financial markets’ will be placated. But not only does this tactic just reinforce the public’s lack of education about monetary matters and biases them to accepting lies from the mainstream economists it also sets up a huge target when it becomes obvious the Labour government cannot operate within the rule. I have explained all that in previous blog posts. But the idea that a political party should wait until they attain government before they try to alter the perceptions of the voters is the trap that social democratic parties have fallen into over the last several decades. They think that they have to express a regard for the ‘financial markets’ and the big corporations or else these elites will destroy them. Although there is a little more to it than that. Many of these so-called progressives are, in fact, operating in league with the elites and are rewarded with sinecures and jobs when they transit back into non-political life. Former US President Obama gave a good demonstration of how he is the thrall of the financial elites yesterday. He was campaigning for the Democrats in the upcoming mid-term elections and appeared at the University of Nevada. The threat to our democracy does not come from one person in the White House or Republicans in Congress or big money lobbyists. The biggest threat to our democracy is indifference. There is only one real check on abuses of power, one real check on bad policy, it’s you and your vote. Upon which the local Democratic official started to chant “You vote, we win”. Which I immediately concluded would further entrench the “abuses of power”. After all, the Democrats and Obama as President hardly did anything to stop the financial and corporate elites from running roughshod over the American people. He had a revolving door of Wall Street banksters coming and going from his Administration. When you hear all this talk about economic miracles, remember who started it … I hope people realize there’s a pattern that every time [Republicans] run things into the ground and we’ve got to clean it up. So it is unclear whether the social democratic politicians are just ignorant of the trends in the economic literature, or aware that MMT presents a superior understanding of the monetary system but reluctant to rock the boat, or, worse, in the pay of the banksters (implicitly or not). All three options lead to a lack of leadership and the sort of decline in democratic richness that we have seen evolve over the last several decades. That is background for the next information. The Federal Reserve Bank conducts a three-yearly – Survey of Consumer Finances (SCF) – which provides a wealth of information about how US families are faring and sharing in the income and wealth generated by economic activity. The most recent survey was 2016 and I have been analysing the data that is publicly available. The Federal Reserve, itself, has presented some of the evidence already in rather stark terms. On September 13, 2018, they published their latest FEDS Notes – A Wealthless Recovery? 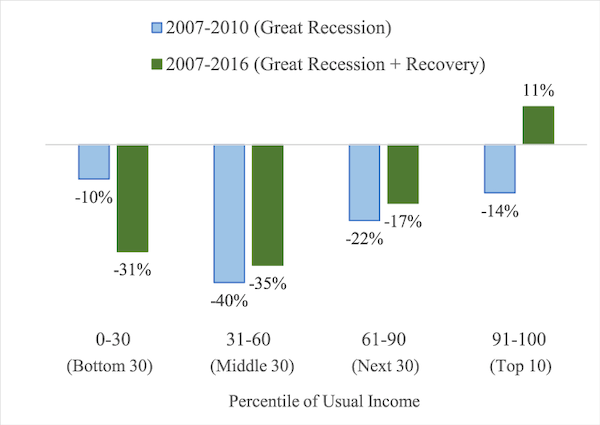 Asset Ownership and the Uneven Recovery from the Great Recession – which analysed the impact of the GFC on American wealth holdings and the wealth dynamics since the recovery began. 3. But, “wealth is highly concentrated–as of 2016, 80 percent of aggregate wealth was held by only 10 percent of households”. They presented the following graph to summarise the results. The Percentiles are based on “usual family income”. So the aggregate figures indicating net wealth is now higher than it was in 2007 are highly misleading. That result arises because of the tremendous skew in the distribution and the fact that the top 10 per cent are 11 per cent wealthier than they were in 2007 in real terms, while the rest of the families are variously much poorer. Their analysis provides an understanding of why the recovery has only been of benefit to the top 10 per cent. 1. Home ownership rates have declined for the bottom 90 percent after the crisis. 2. First home buyers in the bottom 90 per cent have declined sharply. 3. Credit is being denied to lower income groups while rents-to-income ratios rise. 4. The bottom 90 have also seen their share holdings decline and their pension fund wealth decline. 1. The ratio of average wealth held by the Top 10 to that held by the Bottom 30 has risen from 23 in 1995, to 45 in 2007, to 72 in 2016. 2. The ratio of average wealth held by the Top 10 to that held by the Middle 30 has risen from 12 in 1995, to 17 in 2007, to 30 in 2016. 3. The ratio of average wealth held by the Top 10 to that held by the Next 30 has risen from 6 in 1995, to 7 in 2007, to 10 in 2016. In other words, there is massive wealth inequality and it has been getting worse, particularly at the polar ends of the distribution. Here are some graphs I produced from the latest data. 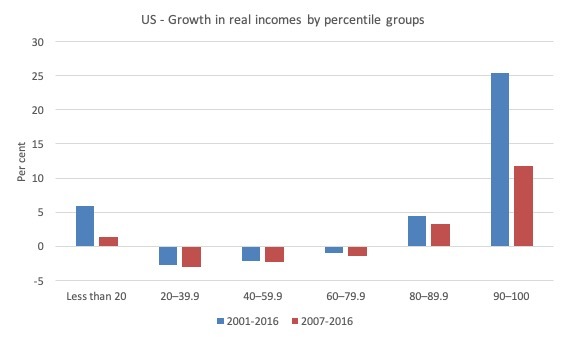 The first shows real income trends in America – 2001-2016. The blue bars are the percentage growth in real family income from 2001 to 2016 (the entire sample). The red bars show the period since the GFC (2007-2016). The results are rather stark. There has been virtually no growth in real income for the Bottom 20 since the crisis and subsequent recovery. For the 2nd to 4th quintile families, their real income has declined over the entire period and most of that is due to the GFC and the failure to share in the income growth in the recovery. And the top-end-of-town has done particularly well, especially the Top 10. The next graph show a variation on the first graph from the Federal Reserve FEDS Note. 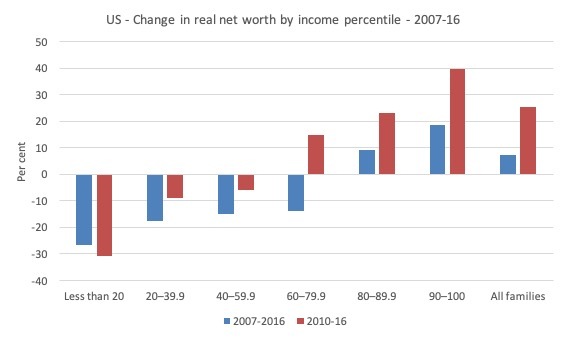 It show the percentage change in family real net worth (wealth) by income percentile group for two periods: (a) 2007-16; and (b) 2010-16, the latter period being the recovery. The bottom three quintiles have gone backwards over the whole period although the recovery period has harmed the poorest American families the most. Measured over the entire period (2007-16) the fourth quintile is poorer but it has offset some of that dent on its wealth during the recovery. The top two quintiles haven’t missed a beat. Going back to the original question, the conservative, wait-until-we-are-in-government approach gets the progressive side of politics no where. The fact is that the income and wealth trends in the US, while probably more extreme than in other nations, are representative of what the neoliberal era (including the so-called Great Moderation era that mainstream economists love to promote as ‘stability’) has delivered for most families. If you then marry those trends with trends in employment quality, pay, conditions etc and other things that impact on the quality of our daily lives, it is not hard to construct a narrative that this period of history is one of the all-time great hoists by the top-end-of-town. Despite economic growth generating massive income gains, the benefits of that growth has been expropriated by the wealthiest and highest income earners. In turn, they wield enormous political power with the riches they have accumulated and sucked out of the system. Hardly any of them were brought to justice during the GFC even though it was obvious that corruption and criminality was part of the story. And, while they harangue governments about handing out pittances to poor people via income support they have their very large hands out demanding public funding for their own activities. And, if they cannot be bothered building things themselves, they demand governments hand over public health systems, public education, public transport, public energy generation, public water supplies – at rock bottom prices and then, further demand the public purse provide ample subsidies to them to continue to supply essential services. And, when it all f&cks up, they demand bailouts. If that is not enough for a progressive political party like the British Labour Party to present an Oppositional manifesto that takes these parasites on front and centre then I am at a loss to understand what they would be able to do when in office. The public are ready for progressive leadership. They know they are being dudded. But then their political representatives and their smug advisors wander around the countryside telling them that they can only spend if the financial markets are happy with them. I am reading Nicholas Shaxson’s new book – The Finance Curse – at present (it only just came out). … we’re told we must turn a blind eye to money-laundering and appease big business with tax cuts We are told global finance is about wealth creation; the reality is wealth extraction. He argues that root-and-branch financial market reform is required including legislating to ensure the government calls the shots not the other way around. This includes reinstatement of capital controls when needed (I discussed these with John McDonnell at our recent meeting); breaking up of large accounting firms, making much of the speculative capital flows illegal, and more. Just what British Labour should be putting into their Manifesto and spending the next several years educating the public on why and how. As part of that demonstration of leadership they could also dispense with their ridiculous fiscal rule. If now is not the time for courageous political leadership from progressives then it is hard to imagine when it would be right. I was listening to this suite on a plane flight yesterday and today the postman delivered the folio I had ordered with original manuscripts (hand written) for the three Gymnopédies and the corrected proof sheets for the Gnossiennes by French composer and pianist Erik Satie. There was also some biographical information which was interesting. Here are the six Gnossiennes played by the Dutch pianist – Reinbert de Leeuw – who has made something of a career interpreting the work of Erik Satie. While the pieces appear deceptively simple, try getting the tempo correct and keeping it even. It is a very hard exercise. Also it is very difficult to get the clear separation between the melody and the chordal accompaniement including getting the right pedal exactly coordinated with the bass notes. Suffice to say – Erik Satie was a genius. Erik Satie also can be accorded the status of a post minimalist 100 years before its time. That is the way I see his compositions. Needless to say I will be working through the corrected sheets for piano later today. And it beats writing about stupid fiscal rules and dealing with characters who have only one defence when you expose their folly – ‘oh, he just misunderstands the rule’. Sure. Is the fiscal credibility rule purely about pandering to the financial markets? Is it not as much about relatively responsible politicians voluntarily tying their own hands to remove the temptation to behave recklessly, especially at election time? And would that not be a good thing? With leadership of The Labour Party rigidly stuck in 1970 and the Conservative Party still in the Gilded Age progressive leadership is sorely missing. AND Brexit could work given a progressive government however given the current leadership is Brexit a good idea. If you were given the task of making the EU function on a sensible non-neoliberal, non-austerity basis what would you do? The so-called relatively responsible politicians are voluntarily tying their own hands to remove the temptation of providing full employment and redistributing the national income in a progressive manner. In my opinion everything else is a smokescreen. I don’t even understand why people have any hope that if the British Alexis Tsipras wins the elections, it will be any different. It is Donald Trump who says about spending on upgrading nuclear weapons “Until people come to their senses, we have more money than anybody else by far, we’ll build it up until they come to their senses.” Where exactly does Donald Trump get money from for the new nukes? So he knows perfectly well how things work, he doesn’t care about “the temptation to behave recklessly, especially at election time”. Donald would say about the British Labour the same he said about “Crooked Hillary” – “Bad. Losers”. Unfortunately I would agree with Mr Trump on this. It’s an ironic sign of the bizarre times we live in, that Donald Trump is the only Western leader who appears to understand modern money creation, and, albeit inefficiently and misguidedly, is perfectly happy to increase budget deficits to suit his political agenda. He even stated on the campaign trail, something along the lines that the U.S. can spend as many dollars as it likes. And the Democrats are now reacting by attacking his profligacy, and promising fiscal “responsibility”! It would be funny if it weren’t so tragic. A) Abandon the Euro, and the Lisbon and Maastricht Treaties. B) If not A), then at least perform fiscal transfers within the Eurozone to mitigate its worst effects. Neither of the above will happen voluntarily, so there’s really nothing that can be “done”. 2. Dissolve the EU in its current form – including the Common Agricultural Policy and allow all exchange rates to float. The re-imposition of capital controls might be required. 3. Create new intergovernmental dialogue and agreements to manage large-scale political issues such as climate change, migration, human rights. 4. Fund the initiatives that might arise from those agreements proportionately across the parties to the agreement. 5. Allow individual states to use their fiscal independence to advance prosperity for their citizens. I have always felt like the social democrats have become the “noveau riche” in a metaforical country club: they try so hard to earn the respect of their new peers and fit in, that they are willing to “out-snob” them and are pathologically afraid to be shunned, i.e. they brag about how much more financially responsible they are and how the deficit goes down when they are in power. Of course, both the efforts of the “noveau riche” and the social democrats go not only unnoticed but are either ignored or even mocked. That is why I welcomed the refreshing posture of Bernie Sanders in America who, instead of running away from the “socialist” label, fully embraced it and threw it back at the neo-liberal chicken-hawks among the GOP and the Dems. There is a better way forward, but I fear that the boat hasn’t been rocked enough just yet. Love Gymnopedie. De Leeuw plays the pieces quite slowly, which makes them relaxing to listen to. Agree about Satie. How he got so much out of so little is amazing. Regarding Bernie Sanders … In spite of his progressive stance, he choked when he was asked *the question* (namely, how are you going to pay for it?). He choked, I think, because he wasn’t prepared to deliver a strong and consistent MMT-friendly argument — because he didn’t and doesn’t really understand MMT, or doesn’t quite believe it, or doesn’t know how to make it believable, etc. *The question* needs to be answerable in clear and simple terms that ordinary people can understand if MMT is to have any political clout on the campaign trail. Meanwhile, to echo bil’s point, progressive political would-be-leaders also need access to advice from economists who fully understand MMT and know how to make it work (not limited to sound-bite jargon). The notes of Shaxon’s book occupy about a quarter of the length of the thing. And they are endnotes, which I hate. Publishers should rethink this. But somehow I don’t think this is going to happen. It is hard to disagree with any of the points raised in the article. The entrenched forces of those who would resist such change are very powerfully embedded in in institutions and have control of an incredibly powerful, though totally disingenuous and self-destructive, household analogy. Mical Kalecki very relevant undoubtedly, as has been commented previously by others. These conservatives no doubt are firmly of the belief that their strategy and actions are on behalf of the ‘national interest’ (a very commonly heard, and very suspect phrase). Therefore one should not be totally unsympathetic towards those who are cautious about challenging them head on, observing the maxim of the ‘art of the possible’, despite fundamentally disagreeing with them, as I do also, for the many reasons Bill set out in the article, though I am new to mmt. ‘For if not now, then when?’ Indeed. Not a totally random thought: one avenue that might be generally kept open to explore, is to be aware of the possibility that in some areas semantics might be creating unnecessary divisions in some instances. No example immediately springs to mind. Just a general suspicion for now. The Finance Curse looks interesting. I’ll see if Waterstones have it this afternoon and if not I’ll do the dirty and order it from Amazon. I don’t usually provide commercial information other than for my own work (or MMT authors). But in the interests of avoiding Amazon, you can purchase it on-line from Penguin (the publisher). If you then marry those trends with trends in employment quality, pay, conditions etc and other things that impact on the quality of our daily lives, it is not hard to construct a narrative that this period of history is one of the all-time great ‘hoists’ by the top-end-of-town. Knowing what is going on in the real world (the rise of nationalism and fascism), it is very hard to believe that dissolving the EU even if it is replaced by the intergovernmental dialogue would not lead to serious conflicts, possibly a war. (Orderly dissolving the Eurozone is a different story). We cannot even convince the majority of people to acknowledge the simple fact that a government operating within the framework of its own fiat currency does not need to fund its expenditures by acquiring pre-existing financial assets in the same way individuals have to do. How can we convince people that lack of tolerance, hatred, racism, nationalism and violence are counterproductive? (Violence may be beneficial for the few, everyone is stupid enough to believe that he will be the one who wins). The EU in some form as a supervisory body is badly needed, not only in Central / Eastern Europe. We don’t need to visit Transylvania or South Tirol, even little Northern Ireland is a potential flash-point (that’s why I believe the Brexit will be undone one way or another). Populists can easily win elections if too much emphasis is put only on national sovereignty. There is absolutely no guarantee that the progressives have a greater chance to convince people to their ideas than fascists. That’s why so many so-called progressives are desperately clinging to the status quo, they don’t want to rock the boat. A practical example of the benefits of having the EU is the recent decision of the European Court of Justice suspending the decision of the Polish parliament to lower the compulsory retirement age of the Supreme Court judges (what was used to sack them). The ruling party cannot remove the main roadblock on the path to irreversibly “reforming” the country so that it becomes an “illiberal democracy” for the next few generations or so. What needs to be done instead of abolishing the EU is rewriting Article 63 (and a few following) in the Treaty of Lisbon “Within the framework of the provisions set out in this chapter, all restrictions on the movement of capital between Member States and between Member States and third countries shall be prohibited.” This section effectively enshrines the rights of the owners of capital to make profits and prohibits any competition from the states either in the form of large public investment or targeted spending. Even worse, the financial capital cannot be stopped from destroying national economies (I can give a few examples). Governments cannot run high budget deficits, etc. The EU is not ideologically-neutral, it is liberal (or neoliberal) by design. But it might be easier to change this rather than make an attempt to build a “socialism in one country”. EU is based on the foundations of human rights, democracy and so-called free market economy. It is the last item what needs to be changed, everything else is actually quite good, far better comparing with what was available before the 1939. Before 1987 I had no passport and my family was blacklisted by the communists. In 1990 I had to queue for hours to get a tourist visa to Sweden, nowadays I can settle and work everywhere with my Polish passport (even if I am quite happy to live in Australia). People born on the “better” side of the Iron Curtain take this for granted. What about crafting a positive vision for a true social-democratic EU where the private ownership of capital is considered to be a privilege coming with mutual obligations, not just a natural right as in the current liberal version? What about distinguishing between productive investment which should be allowed in general and speculative capital flows which should be banned? Is the idea of constraining and reforming the capitalism so that it benefits everyone and controlling the markets naive? It might sound naive and impossible in the current political climate but far worse is an illusion that if the current EU is abolished a new crop of fascist dictators won’t appear out of nowhere. Adam K, very thoughtful. How difficult do you think it would be to rewrite Article 63? This is why some of the smartest people ( Chomsky, Harvey..) have nearly lost all hope for representative democracy, and work to develop a system supporting a participatory democracy instead. This perhaps the most important lesson to take from our history, and yet, unfortunately, it seems that most people think it’s best to keep trying to bang their heads through the wall rather than creating a door to walk through. The organization they created as a platform to bring people from around the world together to explore this prospect (IOPS or International Organization for a Participatory Society) has gathered only a few thousand members since it’s launch several years ago. i’d agree with the first part of Bill’s statement here but I’m certainly not sure about the second. For the following reasons. 3) The Government as household has a massive tenacious grip and Labour has not even begun to loosen this. 4) Stress, poor mental health, zero adult education facilities, intellectual poverty, crap T.V, ghastly journalism creates a stupifyingly impoverished environment. 5) Many people are in a daze and either hanging on to what they have or shambling around dulled by the feeling of being overwhelmed. 6) Few even know the basics of our monetary system. Yet it won’t be vigorously challenged at all despite the grotesquely insulting, demeaning and offensive nature it has! Sleepwalking isn’t the word! And as Adam K points out above, the potential is dangerous. Adam K, you say ‘EU is based on the foundations of human rights, democracy and so-called free market economy’ yet the ECHR predates the EU and was drafted by the then Council of Europe (1954?) as far as I know. I’m not sure I agree that only the last item needs dealing with (free market) the first two are by no means a taken-for-granted given the ‘democratic deficit’ that we all know about and Bill documents in his and Tomas Fazi’s book. I was hoping here in the UK that a Lexit would happen and Labour would show Europe the way forward but that hope is diminishing for the reasons Bill lays out in this post. Adam, I think your argument is naive. It is easier to end neoliberalism in one nation than to end it in a supranational institution comprising 28 nations. It is easier to end neoliberalism through the democratic processes of a nation than through the deeply technocratic, democracy-deficient institutions of the EU. I’m not saying that it is easy. I’m just pointing out that reforming one nation through democratic means is surely not as difficult as changing a technocrat-driven supranational institution of 28 nations. I think you are also far too timid and defensive in your approach to politics. Yes, in a democracy, right-wing people can win. Them’s the breaks in a democracy. Sometimes your opponents win. But your faith in mythical progressive tendencies of the EU is misplaced. The EU is intrinsically and irretrievably committed to the interests of capital. It is important for progressives to be proactive and to enact their desired changes at a national level. National democratic politics offers progressives a chance that is simply not available at all through the EU. J Christensen, are you by any chance a colleague of Nick Shaxon and associated with the Tax Justice Network? Nicholas, “The EU is intrinsically and irretrievably committed to the interests of capital.”: you don’t think this is also true of the UK elite? Read Shaxon’s book and Reckless Opportunists. In certain respects, the UK elite is worse than the EU elite. In other respects, the position is reversed. Larry, it is easier to replace UK elites than to replace EU elites. One UK general election win and judicious use of the power to fire officials and replace them with progressives is enough to do it. By contrast, the European Parliament is weak and fragmented. Even if by some miracle a cohesive progressive coalition gained a majority in the European Parliament, that would accomplish little. The European Council, the European Commission, ECOFIN, and the ECJ would still be there beyond your reach. The smart play for progressives is to exit the EU and focus on national politics. Hi Larry, no, I’m not that J Christensen. I like what they do though. Raising interest rates because of monetary policy targeting inflation by CB s instead of rounding up and penalizing the tax cheats and developing policy that aims for full employment is deplorable. They manage on participatory democracy principles to boot! Fully agree with AdamK’s well-argued case for not dispensing (almost casually the way Bill puts it, alas) with the EU. I suspect Bill has become overly-soured through his intimate acquaintance with the sordid details of the process whereby the original, within the bounds of the politically-achievable idealistic, aims of the EU’s founding fathers were step-by-step perverted into serving an entirely different ideological agenda. With all due respect to Bill I think that his is a serious over-reaction, albeit a fully understandable one. Surely, the turning-point in that process was Maastricht and in particular the unprincipled machinations on the part of a few well-placed and canny insiders which paved the way to it. Without that disastrous mistake the EU would eventually have found itself compelled to find better solutions to the problems which its previous contortions (the snake, the snake in the tunnel, the “green” pound/franc/you-name-it) had futilely attempted to cure. There would then have been no other choice left (short of dissolving the EU) than to allow all the various currencies to float freely against one another, and to force the EU’s institutions – the CAP primarily – into conformity or else discarding them. It could have been done given the right degree of commitment, driven by necessity. Besides, given that Bill’s menu item #1 were to be achieved, what compelling need is there to order the rest of the items on his menu? Or could we – perish the thought – be allowing ideologically-determined predilections to prevail against cool analysis? Exactly my sentiments. And my sentiments for years since the rise of Clinton and Blair and their flawed bob-each-way political philosophy that the state can foster both rampant, unregulated marketisation of all aspects of human life AND promote greater equality. “… I’m just pointing out that reforming one nation through democratic means is surely not as difficult as changing a technocrat-driven supranational institution of 28 nations”. Admittedly it wasn’t 28 nations then (I forget the number) but “reforming” (as they saw it, God rot them) the EU didn’t prove very difficult for Delors and co-conspirators when they were running the EU – and incidentally running rings around the democratically-elected politicians, by the simple device of denying them access to the decision-making process until it was too late for them to do anything except let themselves willingly or unwillingly be swept along by the prevailing groupthink current (all except Gordon Brown – and Danish counterpart). Resulting in Maastricht and the eurozone chimera. If that wasn’t an impressive, and successful, coup I don’t know what is. So I think your premise is dubious. Jeremy Corbyn and John McDonnell are brain-washed but arrogant monetary system ignoramuses irrationally hanging onto the stupid belief money only grows on rich people! These people are no country’s saviors! Strange that depending on who you read depends on the message. I read plenty of others who say the opposite and that socialism is rampant and recently it was claimed that goldman sachs prevented employees from donating to republicans…does it really matter who is in town as far as the elite are concerned? is any politician going to be able to resist the temptations? In my 45 years I have never once heard any human being say that a politician can be trusted – which begs the question why we would ever want politicians to be educators of anything? If YOU can’t educate a politician, then on what grounds should I expect them to be worthy of educating me? Ever thought of running for office yourself Bill? Robert, technocracy has overwhelmingly favoured neoliberal ideology. Who are the high level progressive technocrats who are in a position to undo the neoliberal rules embedded in the Maastricht Treaty? There are none (or not enough, with no chance of that changing in the next few years). Progressives’ only option is to use democracy. Technocracy won’t get us the outcomes we want. The EU is a profoundly undemocratic institution – far less democratic than the UK Parliament. It is smart for the UK to get out of the EU and for UK progressives to take the opportunities afforded by this change. Win a majority in the UK Parliament and use statutes to enact the rules that you want. That is much more realistic than reforming the European Commission plus the European Council plus ECONFIN plus the ECJ etc etc. Progressives must trust to democracy and mass movements to make their desired changes to economic policy. Technocrats will not deliver the outcomes that progressives want. The EU is a technocrat-heavy institution that is far less responsive to popular will and mass movements than the UK House of Commons. It makes sense for progressives to get out of the EU and to contest domestic politics. OK – your point is well made. I concede! It was of course the technocrats who won the Maastricht/common-currency battle (though Delors was through and through a politician, transplanted, which was what enabled him as Commission president to employ political tactics as deftly as he did). So that episode supports your position rather than mine. The national politicians making up the Council of Ministers (and EcoFin) are anchored into their respective countries’ power-bases which ties their hands in Brussels, whereas the technocrats on the Commission (most (all?) of whom were previously national politicians themselves) are anchored into nothing except the EU governing apparatus which in practice means that they’re unencumbered by being accountable to anybody. So the Commission president’s position is perhaps not unlike that of the General Secretary of the Communist Party in the late-lamented Soviet Union…? Schofield, I regret to say that I am in agreement with you about Corbyn and McDonnell. I wish it were otherwise. But I would ask you, would you rather have the present incompetent fanatics in office much longer? I don’t. Some of their programs will be progressive and alleviate a good deal of the present distress though their defense of them will be defective and they may not be good enough. And their ridiculous fiscal rule may prove to be an Achilles heel in the end. So, not superb, but good enough? There is one perfectly acceptable element in Labour’s fiscal rule and one totally unacceptable element. The acceptable element is this. Under the fiscal rule, the central bank cuts interest rates by whatever amount it thinks maximises employment as far as is feasible without sparking excess inflation. And when interest rates are at or near zero, fiscal stimulus kicks in. Nothing wrong with that. What’s wrong is the “balance the books over a five year period” bit. There is no reason whatever for balancing the books over a 1,5,10 or XYZ period of years. “Private Sector Net Financial Assets” as MMTers call it (i.e. base money plus government debt) need to be whatever the private sector wants to hold. That could turn out to be five times GDP in ten years’ time, or it could be next to nothing. Any pre-conceived ideas as to what it might be are BS. The central bank can cut interest rate, raise interest rate, or whatever. It will have ZERO impact on employment. The UK’s been through this before. Remember Dennis Healey unnecessarily running off to the IMF for a loan. Well with Brexit fast approaching No-Deal economic chaos do you honestly think a Corbyn/McDonnell government with their monetary illiterate deeply embedded conviction money only grows on rich people wouldn’t do the same and thereby be pressured to ratchet up austerity even more? schofield, if they only do part of what they have promised they would, then surely that would be better than what is presently going on. Of course, they may be lying. I don’t get the impression though that either of them are lying about their proposed program. In addition, the upcoming budget may, or may not, be as bad as some think it might be. In either case, the proof will come. Schofield, I remember Healey and I criticized his ridiculous policy at the time. I thought he was incompetent as a chancellor, though he did have some good one liners. Before he called in the IMF, I thought he might have some exchequer chops. And now, as then, it may be that the two principal players are more incompetent than I have initially given them credit for being. Having said that, I do wonder how bright Corbyn is, as he has said some incredibly stupid things when he should have known better. I have to go to bed but I scanned the top bit. The subheading is rubbish. There is no way that Hammond’s spending power will be reduced by Brexitm no deal or otherwise. Whether it would be effective is another thing. Will read the rest tomorrow. Thanks, Scofield. I have to go to bed but I scanned the top bit. The subheading is rubbish. There is no way that Hammond’s spending power will be reduced by Brexit no deal or otherwise. Whether it would be effective is another thing. Will read the rest tomorrow. Thanks, Scofield. “… And when interest rates are at or near zero, fiscal stimulus kicks in. Nothing wrong with that”. Not so. Bill’s article (which you appear not to have fully assimilated) explicitly demolishes that blithe assertion, by demonstrating that interest-rates are most unlikely ever to be deemed by the Monetary Policy Committee of the BoE to be low enough – judging on past form – for monetary direction to leave the field clear for fiscal stimulus. So it will almost certainly never “kick in”, which is a major plank in Bill’s demolition of Labour’s fiscal rule. Thus the element of it which you judge “acceptable” would be unacceptable to anyone who judges Bill’s perception to be better-grounded in the real world than yours seems to be. The MMT approach to fiscal policy is to include a job guarantee to ensure precisely directed fiscal stimulus targeting unemployment occurs automatically and long before the monetary policy ammunition (interest rate) runs out. As has been discussed many times before and repeated in commenters here, monetary policy makes for a very poor governor of employment levels, if it even has any effect at all. The MMT approach to fiscal policy includes a fiscal policy tool (job guarantee) which directly addresses unemployment long before the monetary policy tool (interest rate) is exhausted. always support the neo liberal narrative [more stuff for them and their families]. can be used to help them in this then the fiscal rules they adopt are irrelevant.